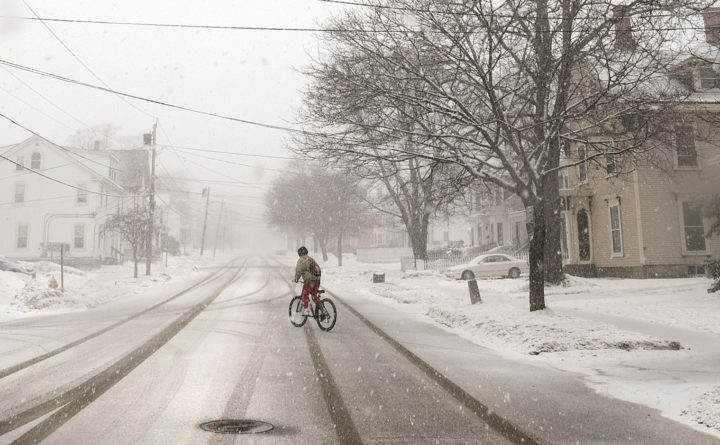 A bicyclist rides on Ohio Street as heavy snow started falling in Bangor on March 13. A powerful nor’easter approaching the East Coast will deliver a glancing blow to Maine, bringing the potential of up to 6 inches of snow in the midcoast area. The National Weather Service says snow will begin falling Wednesday evening on the southern Maine coast. Heavier snow accumulations are expected to the south, in the fourth nor’easter to hit within three weeks. Meanwhile, lighter snow amounts are expected inland and to the north. In Maine, it’s been a snowy season with 128 inches in Caribou and 89 inches of snow in Portland. Both are far above average.